Lead time is defined as the time from order confirmation to dispatch from the warehouse. It consists of the PCBA production time + warehouse packing time. - PCB manufacture time depends on individual order parameters and may affect the PCBA production time. 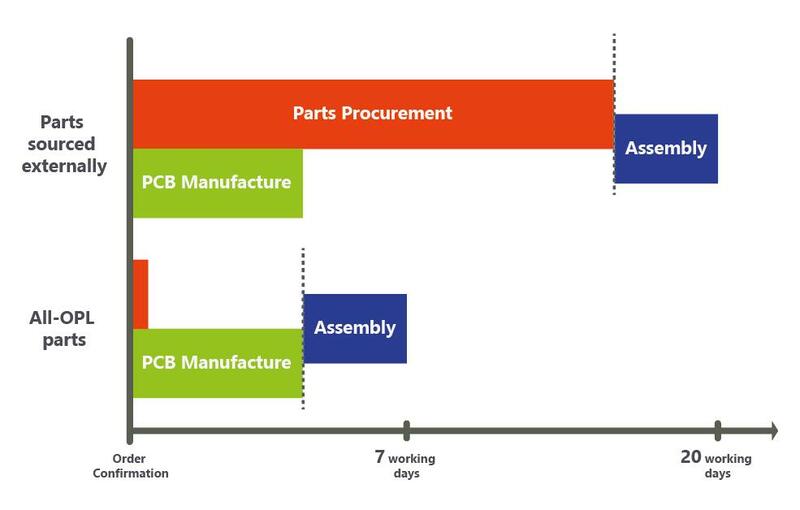 The average PCBA production time is based on the majority of PCB orders with a production time of 4 working days or less. - For large batch orders, the assembly time may be longer, but this will be calculated on the order form. Comparison of the average production times for All-OPL orders and orders with externally sourced parts. Notice that for orders requiring externally sourced components, much of the production time consists of waiting for components to be imported in. So by using in-stock or local components (PCBA OPL), the production time can be significantly reduced. - All days quoted in working days, excludes weekends. - The lead time does not include any delays that may arise due to abnormalities e.g. problems with the PCB Gerber files, incorrect pad sizing, incorrect parts, etc. Please leave a few extra days for such occurrences and triple check all information before placing the order. - Please keep an eye out for direct e-mails from us to minimize delays. We may need to contact you at any time. - Shipping time is not included in the lead time and depends on the destination country and the shipping method selected.